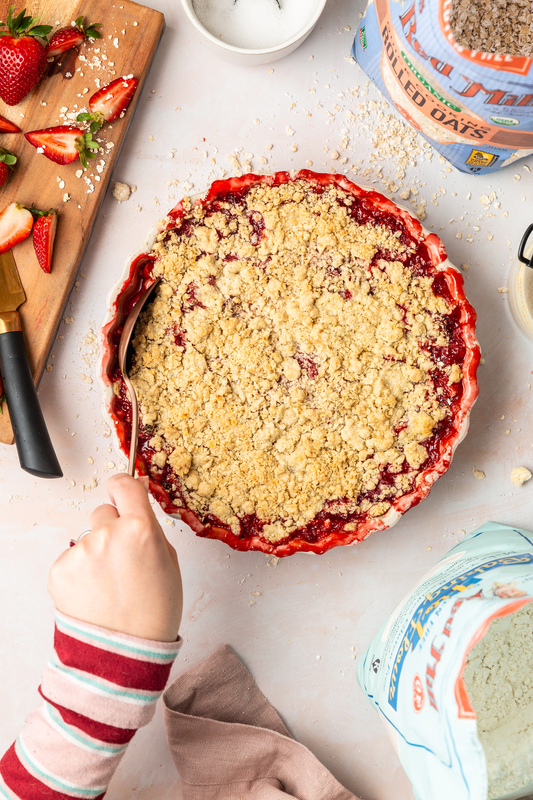 This Strawberry Rhubarb Crisp (Gluten-Free) is an easy and delicious spring rainy day baking project that can be made in under an hour! This is a sponsored conversation written by me on behalf of Bob’s Red Mill. The opinions and text are all mine. Thank you for supporting the brands that make VV possible. Hey spring, hey! I’m beyond excited that the days have not only started to get longer and warm up but also that fruit has started to pop up at the market again! Towards the end of winter, I always start to get these daydreams about spending every spring day outside in the garden or strolling our streets with my pup, Tuko. But, if we are being honest, spring usually ends up being filled with so many rainy days that we still do spend a lot of that season indoors. Luckily for us, we’ve got baking (and rhubarb!)! Got a rainy weekend on your hands? No problem! Open your kitchen windows to let the sound of the rain pour in and crank up your oven because it’s baking time! In years past, I’ve tackled cakes, pies, and cocktails so this year I decided it was time to make a crumble (pretty sure this could be the first crumble on the site? Wooooah to that!). But, because I can’t ever just keep anything simple, I decided to make it a gluten-free crumble because why not? I get asked about gluten-free recipes all the time and this one felt like such a no brainer! Why you ask? Bob’s Red Mills has SO many really great gluten-free baking ingredients that are easily accessible at most groceries or online. If you are not used to baking with gluten-free ingredients, the trick to making this crumble gluten-free really is just to make sure that you use gluten-free oats (I used these ones from Bob’s Red Mills) and an all-purpose gluten-free flour (I used this one). Viola! It’ll still be gooey and fruity and oh so delicious! For this crisp (or crumble – as some people like to call it), I used a higher ratio of strawberries to rhubarb than a lot recipes because I wanted to be able to add less sugar. I’d recommend giving your strawberries a taste before baking to see how sweet or tart they are – if they aren’t super sweet, you may want to consider adding another 1/4 cup or so of sugar. Finally, you are welcome to enjoy this however you want but can I please suggest you top it (while it’s still very warm and gooey) with ice cream? I promise you will not be disappointed. Preheat oven to 350 degrees and grease a 9 inch circle baking pan. In a large bowl, combine rhubarb, strawberries, sugar, and 1/3 cup flour. Transfer to prepared baking pan. In another mixing bowl, mix together remaining flour, brown sugar, oats, cinnamon, and nutmeg. Use clean fingers to incorporate the butter into the flour mixture until it has the consistency of course cornmeal. Sprinkle mixture over strawberry-rhubarb mixture making sure to cover the entire top. Place pan on a baking sheet (in case anything boils over) and bake for 30-35 minutes or until the sides are bubbling and the top is browned. On today’s Simple Sunday feature we are covering Gremolata vs Chimichurri: What is the difference? Simple Sunday is a feature where we deep dive into simple recipes, spotlight ingredients, and/or feature recipes for specific occasions. Today we are diving into gremolata and chimichurri sauces! Although both are known for being served with meat, they both also make great condiments to jazz up a plate of roasted veggies, toss over scrambled eggs and grits, or use as garnish on a creamy soup. So what exactly are these sauces and how do you know when to use which one? 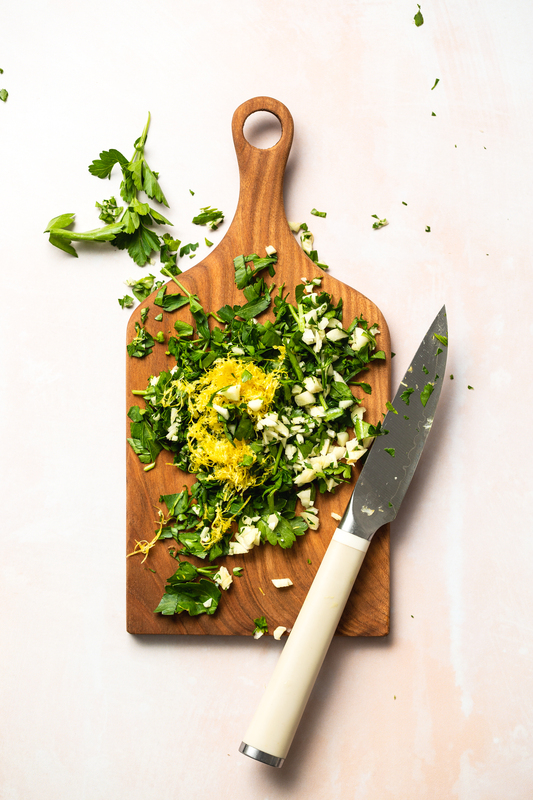 The dictionary definition of gremolata (also called gremolada) is an Italian chopped herb condiment or dressing made with lemon zest, chopped parsley, and garlic. It is traditionally served with meat or fish. A dictionary definition of chimichurri is a South American and Mexican “cooking” (I like to think of it as serving sauce since you don’t actually cook with it) or marinade traditionally used on grilled meat. It most often contains parsley, garlic, vinegar, olive oil, and chili pepper flakes. The sauce is usually uncooked and is said to have originated in Argentina and Uruguay. Gremolata vs Chimichurri: What is the different? As you have no probably gathered by reading their definitions, there are a few key differences including the ingredients (gremolata usually contains lemon zest while chimichurri has vinegar, olive oil, and chili pepper flakes), and the sauces origins. For me, I think the biggest difference to note is that chimichurri has liquid ingredients (like vinegar and olive oil) so it’s better suited for recipes that could end up being on the dry size versus gremolata would be great for a dish that already has had oil added to it or topping on a soup. gremolata (also called gremolada) is an Italian chopped herb condiment or dressing made with lemon zest, chopped parsley, and garlic. I love putting it on scrambled eggs or roasted veggies. Make sure the parsley is completely dry to avoid having a saggy sauce. Remove leaves from stems and discard stems. Finely chop parsley leaves and then toss with garlic and citrus zest. This Brunch Board with Cheesy Popovers & Dill-Lemon Butter is the perfect Easter brunch meal to feed your hungry family! This post is made in sponsorship with Jarlsberg Cheese– thank you for supporting the brands that support VV! 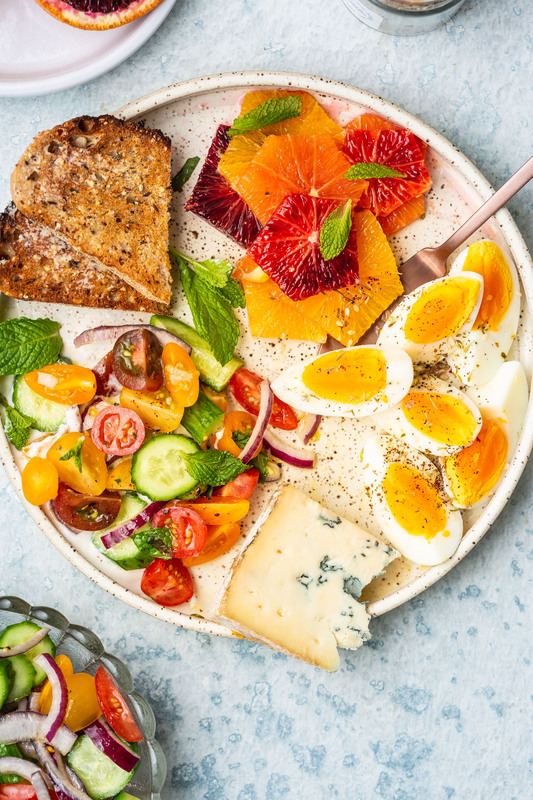 For this year’s Easter brunch, can we please say goodbye to the boring egg casseroles and instead say hellooooo to a vibrantly fresh and super versatile brunch board? Mine is loaded with cheesy mini popovers, Jarlsberg cheese cubes and wedges, lemon-dill butter, sour cherry jam, honey, and a huge pile of blanched / boiled / fresh veggies! Where to even start with this delicious spread. First up, the cheesy and eggy popovers taste like you are biting into the fluffiest cheesy savory pancake without all the work out that goes into flipping them. Instead. whip up the batter, pour into greased mini cupcake molds, pop in the oven, and viola! They come out puffed and slowly deflate as they cool to create the a perfect light bite that is delicious on it’s own but next level if you break it in half and top with cherry preserves and a slice of cheese! The mild and nutty flavor from Jarlsberg cheese is the perfect compliment to sour cherry preserves and the egg based. This is also the only part of the board that requires cooking so make these first and then assemble all of your other components while they bake. 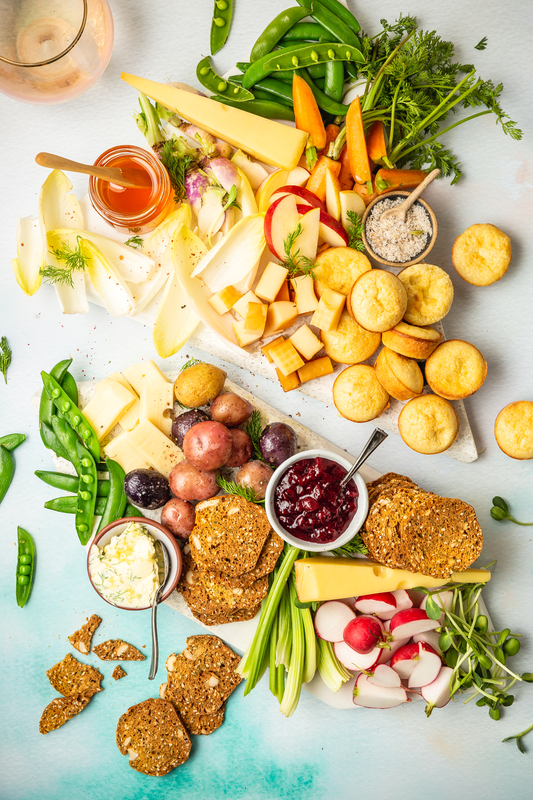 While the popovers bake, whip up the flavored butter (perfect for smearing all over the fresh veggies), chop your veggies, cheese and transfer everything to a serving board. Once the popovers are ready, add them to the serving platter and serve! Interested in making your own brunch board but don’t want to go out and buy all the ingredients? Luckily for you, Jarlsberg has partnered with Marissa Mullen to giveaway an Easter Brunch gift basket! The contest runs from April 5th, 2019 to April 18th, 2019. What are you waiting for? Here are two ways to ENTER NOW! Preheat oven to 425 degrees and butter 3 miniature muffin tins (you can also work in batches if you don’t have 3). Warm the milk slightly by transferring to a large microwave safe mixing bowl and microwave for about 1 minute. Add eggs, melted butter, flour, 1/4 cup shredded cheese, and salt and whisk just until combined (it’ll be lighter the less it’s mixed). Transfer to the fridge and let chill while you prep the pans. Place pans in preheated oven for 2 minutes (but not much longer or the butter you greased with will smoke). Once warmed, carefully remove from oven and pour the batter into the muffin tin so each is about 3/4 full. Bake for 18-20 minutes or until brown on the top. If working in batches, transfer the leftover batter to the fridge to chill while the rest of the muffins bake. Once browned, remove from oven and transfer to a wire rack. Repeat with remaining batter (if working in batches). Once cooled slightly, transfer to serving platter. In a small mixing bowl, use a spatula to fold the lemon zest and dill into the butter. Transfer to a serving dish and place on platter. Toss apple slices with lemon juice and transfer to serving platter. Transfer the jam and honey to serving bowls and add to your platter. Transfer cheese to serving platter making sure to leave space between them. Fill in remaining space on the board with veggies and crackers. Serve! This Spicy Brussels Sprout Wrap with Black Bean & Corn Salsa comes together in minutes for a deliciously veg-packed lunch or dinner. This post is made in sponsorship with Angelic Bakehouse – thank you for supporting the brands that support VV! I’m extra excited about today’s post because I learned A LOT about a topic I was totally in the dark on when researching Angelic Bakehouse’s product: sprouted grains! Sure I’d heard the term before but it wasn’t until I started working with them that I realized all the amazing benefits of eating sprouted grains (according to the Whole Grain Counsel) like the fact that sprouting boosts the nutrients, reduces glycemic index, and is gentler on your digestion. As someone who wears a lot of my stress in my gut, I was extra pleased with the last point! In addition to the benefits of sprouting, I’m loving Angelic Bakehouse’s Sprouted 7-Grain Wraps because they are not only delicious but also made from USA sourced wheat berries that boost higher protein than commodity wheat and void completely of high-fructose corn syrup and refined sugar (which is usually hiding in a lot of wraps I find in the grocery aisle!). Now that I’ve sold you on why you need to start eating more wraps in your life, let’s talk about what to stuff the wraps with. I made this insanely delicious Sesame Cauliflower with Crunchy Ramen Slaw filling a few weeks back (might have to share the recipe on that one soon because it was so. darn. delicious) and decided that I wanted to give my next round with these wraps a tex-mex flare. This time I decided to fill the wraps with a 5 minute spicy broccoli saute and simple bean and corn salsa. It’s far too cold to be eating salads so I really love that the broccoli slaw gives me a boost of green vegetables while still being warm and a tiny bit spicy. The bean and corn slaw only takes a few minutes to whip up and then the flavors meld together while you prepare everything else. I topped it all with simple cilantro dressing to give it a little bit more acid and fat to round out the flavor. You can top these with whatever you like putting onto tacos but I suggest a healthy helping of cheese (like feta) and maybe a little hot sauce if you like a little heat. Mix all ingredients in a bowl and set aside for at least 15 minutes to the corn can thaw and flavors meld. Taste and season with salt and pepper. Add all ingredients into a glass jar with a lid or a Tupperware container with lid. Shake until combined. Taste and season with salt and pepper. Heat 1 Tbsp olive oil in a medium skillet over medium heat. Add spices and saute spices in oil for 30 seconds or until fragrant. Add shredded Brussels sprouts and saute for 3-5 minutes or until they have softened and taken on a red hue from the spices. Remove from heat. Divide the salsa between the 4 wraps and then top with spicy brussels sprouts, a drizzle of dressing, crumbled feta, and hot sauce (if you like heat). Fold each wrap tightly to seal and eat right away. Click here for a special coupon now! This Vegetarian Breakfast Mezze Spread with Tomato Cucumber Salad & Za’atar Eggs is the ultimate easy breakfast. Everything can be prepped and assembled in under 15 minutes and most items are easy to swap out with whatever you have on hand! Let’s be honest – it’s been a minute since I posted a board or platter and we all miss it (…at least I think you do based on a #tbt board picture I posted on Instagram a few days ago). Vegetarian breakfast recipes are pretty common but can you make most of them in under 15 minutes? I didn’t think so. What I also love about a spread like this is that it’s super versatile so you can swap ingredients based on what you have on hand. No blue cheese wedge? Dice up some sliced deli cheese you have hiding in the back of the fridge. No oranges? Swap in apple slices with a little lemon juice. 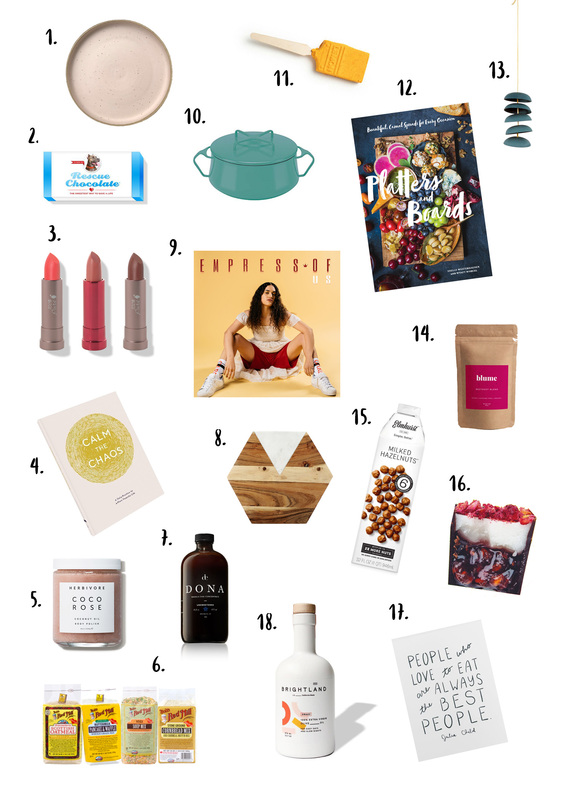 Oh and did I mention this spread is beyond easy to make? Do you know how to boil an egg and chop vegetables? Then you got this! I sprinkled the eggs with a za’atar spice I picked up in LA a few weeks back but if you don’t have it on hand, you can make your own or swap in another spice blend you like (may I recommend the ‘everything bagel’ spice blend?). New to the term mezze (also, according to google, ‘meze’)? The term varies a bit based on regions but in general it’s a selection of small dishes served together to make up a meal (or a appetizer to enjoy with drinks). In our case, we are going to treat it as a spread (similar to tapas) that when served all together is bulky enough to make up a simple vegetarian breakfast. In a medium bowl, toss together the tomatoes, cucumber, and red onion. In a small bowl, whisk together olive oil, vinegar, mustard, mint, and a dash of salt and pepper. Pour over the tomato mixture and toss until all the vegetables are coated. Set aside and let sit for at least 10 minutes. Taste and reason with more salt and pepper, as needed. Bring a small pot of water to a boil over high heat. Add the eggs, cover, and lower heat enough to reach a slow simmer. Let cook for 9 minutes. Remove from heat and run over cold water for 2 minutes. Peel and quarter eggs. Sprinkle with za’atar and a dash of salt and pepper. Spoon yogurt onto a small section of the serving platter and smooth out into a shallow circle. Place the tomato-cucumber salad over it (you may have some extra salad for future munching). Assemble the remaining items around the salad and serve right away. Enjoy! These delicious Brown Sugar Waffles with Orange-Ginger Cranberry Compote is a fun winter variation on your classic waffle. Breakfast is the one meal during the week that I put very little thought or planning into. While I have a meal plan for lunch and dinner that I sit down and create every Sunday, weekday breakfast always continues to stay consistent with yogurt, smoothies, and maybe a cottage cheese throw in there now and then. I think that’s probably why why, when the weekend rolls around, I love the indulgent treat of waking up late and slowly making an elaborate (compared to pre-made yogurt) breakfast for Wyatt and I. Often times, it’s pancakes or eggs with toast but lately I’ve been on a waffle kick and these Brown Sugar Waffles with Orange-Ginger Compote have been hitting all the winter comfort spots: warm, bright, carb-y, sweet, and a touch savory! This delicious winter variation on classic waffles is from Extra Crispy’s fun and colorful cookbook, Breakfast. In a medium saucepan, combine all compote ingredients and bring to a simmer over medium. Let simmer for 20 minutes, stirring occasionally, until thickened. Remove from heat, transfer to a bowl and cover. Chill for at least 2 hours or overnight. Melt butter in a small saucepan over low heat. Remove from heat and set aside. In a large mixing bowl, whisk together flour, brown sugar, baking powder, salt, and baking soda. In another bowl, whisk flour, brown sugar, baking powder, salt, and baking soda. Make a well in the center of the dry ingredients and pour in milk, buttermilk, eggs, and butter. Whisk the wet ingredients and then whisk wider to incorporate dry ingredients into wet until combined. Heat waffle iron according to package directions and lightly coat with butter. Make waffles, again according to the waffle irons directions. Serve with compote and orange slices. This is a sponsored conversation written by me on behalf of OXO and California Olive Ranch. The opinions and text are all mine. Thank you for supporting the brands that make VV possible. You all still on your New Year’s resolution kick to eat healthier? Or did the polar vortex (for my Midwest and East Coasters) or Snowpocalypse (for my west coasters) knock you off coarse with temperatures so cold that nothing besides greasy french fries and gooey pizza would warm your soul? I feel that – I was there too. But it’s slowly thawing and time to get back on track with a bowl of addictively nourishing food! I realize it’s hard to crave a salad in the dead of winter but that’s because so many people think of salads as light and made of flimsy cold lettuce when they can be so much more than that – they can be made with sturdy greens and piled high with warm roasted vegetables and filling proteins. Don’t believe me? Well, today I’m excited to partner with OXO and California Olive Ranch to bring you the exact hearty and filling winter salad I’m talking about. But before we jump into talking about all the components of this Vegetarian Winter Cobb Salad, let’s talk about the partners featured in today’s recipe. Deciding to work with both OXO and California Olive Ranch was a no-brainer. For one, California Olive Ranch is the only extra virgin olive oil I buy at the grocery store and use it for my everyday cooking (literally – I cook with olive oil every. single. day.) so I already had a very strong brand loyalty to them. It’s the only extra virgin olive oil I’ve been able to find on the regular at my local store that has a harvest date (which lets me know it’s fresh) and it has a smoke point well above 425 degrees so I know I can safely bake, sauté, and fry with it without having to worry about burning. This means I can lean on it for almost all cooking situations and I don’t have to worry about buying a new oil every time I want to try out a new cooking method. Although I usually use their ‘Everyday’ Destination Series, I tried out their ‘Rich and Robust’ bottle for the dressing in this salad to let the flavor really shine through, and it was delicious! I used OXO‘s Salad Dressing Shaker and Salad Spinner to make this salad. The Salad Spinner helped to dry my greens quickly so they could absorb the dressing with ease and not water down the salad. The Salad Dressing Shaker is not something I would have ever thought to purchase, but after using it to measure, shake, and pour the dressing, I honestly wouldn’t ever use something else again. The printed measurements on the side of the shaker means I don’t have to deal with dirtying additional measuring cups. And if there is anything we can all agree on it’s that less dirty dishes is always a good thing! And finally, let’s talk about this salad! Our local vegetarian restaurant makes a killer cobb salad that I always order when I go there. The one problem I have with the salad is that it’s just not nearly as good in the winter – the tomatoes are bland, and the lettuce lacks vibrancy (most likely because both are not as fresh as they are during peak produce season here in the Midwest). That is why I wanted to create a cobb salad that didn’t lean on those summer vegetables to make it delicious. I swapped out the tomatoes for roasted root vegetables and the lettuce for sturdy kale and cabbage. I also swapped the meat for coconut bacon and roasted chickpeas because a little salty crunch in your salad is always a good idea. And finally, I made my salad with jammy eggs, but you are welcome to cook your eggs a little longer if you’d rather have a more traditional cobb salad egg experience (I will say that the jammy halves were delicious but a bit messy). This Vegetarian Winter Cobb Salad is a fun seasonal twist that features heartier greens, roasted vegetables, and chickpeas in place of the meat. Preheat oven to 325 degrees and line a baking sheet with parchment paper. Combine the liquid smoke, soy sauce, and maple syrup in a bowl. Fold the coconut flakes into the smoke mixture until they are completely coated with the sauce. Transfer to the baking sheet and spread out onto a single layer. Bake for 20 minutes, shaking and stirring the flakes every 3-5 minutes to prevent from burning (do it more frequently towards the end as they are very prone to burning right before ready). Remove from oven and gently transfer the parchment paper with the coconut bacon on it to a cooling rack (so you can reuse the baking sheet for the veggies). Set aside to cool. Increase oven temperature to 400 degrees and re-line the baking sheet with new parchment paper. 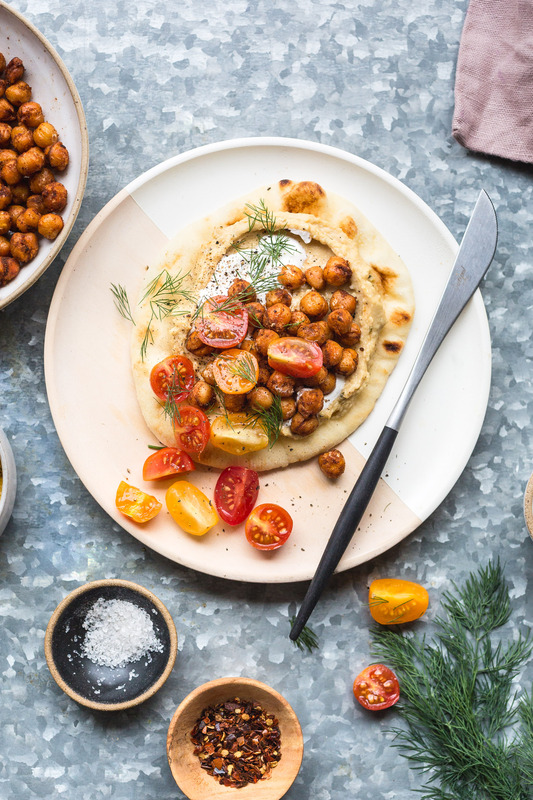 Toss the veggies and chickpeas in 1 Tbsp extra virgin olive oil and a dash of salt and pepper. Transfer to baking sheet in an even layer and bake for 20 to 30 minutes or until the veggies are starting to brown and the chickpeas are crisped. Remove from oven and set aside. While the veggies are roasting, transfer all the dressing ingredients into the OXO Salad Dressing Shaker and shake until emulsified and combined. Set aside. Toss together the cabbage and kale and then place in a big salad bowl. Top with roasted veggies, chickpeas, crumbled cheese, eggs, avocado, and coconut bacon. Start by drizzling half the dressing over the salad and taste. Add more dressing as desired. Serve right away. This Vegan Chili Mac recipe from Power Plates is the ultimate comfort food: a vegan hybrid between macaroni and cheese and chili. I have a confession to make. I’ve been holding out on you. I literally have been meaning to photograph and share this recipe with you for over a year. I received Gina’s Power Plates cookbook last winter and fell totally in love with this recipe – it’s the ultimate comfort food meal: rich macaroni and cheese meets hearty bean chili. Chewy pasta is folded into an easy homemade “queso sauce” and then wrapped up in a quick homemade chili. Don’t let the lack of actual cheese (the queso is vegan) in this recipe deceive you – the homemade “queso” is smoky and creamy and totally as good as any cheese sauce I’ve made at home (including ones with real cheddar). So, if this vegan skillet chili mac recipe and book are so good, why did I wait so long to make this for you? Well, to be completely honest, it was because I knew that it was going to be a tough one to photograph (one bowl meals with all cooked ingredients tend to be) and I was really worried about doing it justice. So worried, in fact, that it took me over a year to get around to finally photographing it. So yeah – such a silly reason but here it finally is! Meanwhile, heat oil in a large skillet over medium heat. Add onion, bell pepper, and poblano and cook, stirring occasionally, for 5 to 7 minutes or until onions are translucent. Add garlic and cook for another minute. Stir in cumin, chili powder, thyme, red pepper flakes, salt, tomatoes, and beans. Lower the heat, cover, and simmer for 5 minutes. When the water is boiling, stir in the pasta and adjust the heat to maintain a low boil. Cool until pasta is al dente (reference package directions). Combine all the queso ingredients in a high speed blender and process until completely smooth. If the sauce is too thick to pour, add another tablespoon of water. Fold tomato bean mixture, pasta, and queso together until combined. Top with scallions and season with more salt and pepper (if needed). This Winter Citrus Almond Cake With Yogurt & Mint recipe is an easy winter cake that can be enjoyed with coffee or tea. Make it when citrus is in season! This is a sponsored conversation written by me on behalf of Bob’s Red Mill. The opinions and text are all mine. Thank you for supporting the brands that make VV possible. You know what gets me through a dark, dreary, wet February? Baking. Baking cookies. Baking bread. Baking biscotti. But you know what my favorite thing to bake is? Yup – you guessed it…cake! It gives me an excuse to get off the couch from binge watching TV, to heat up the house with the oven, and to get my creative ideas flowing endless flavor combinations. 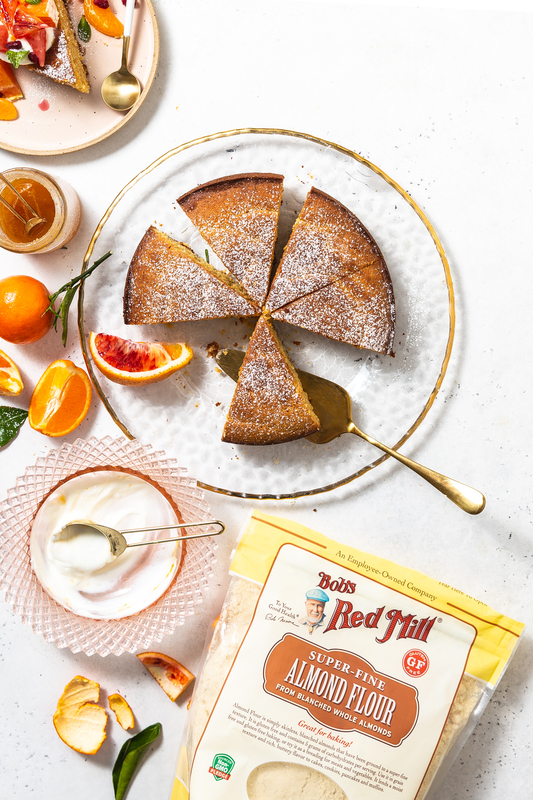 So I couldn’t be more excited to have this post made in partnership with Bob’s Red Mill because their numerous flour (and baking ingredients in general) make it even easier to get the creative ideas flowing by trying out different flour flavor profiles. I decided to focus on their almond flour for this cake because I’ve used it many times before to make super tender blueberry muffins so I knew that the flour would do the same to this cake. I used to be obsessed with blood oranges this time of year but cara cara oranges have stolen my heart these days! This winter citrus almond cake is perfect in it’s simplicity – it’s for weekend snacking, not big special occasions. This versatile cake can be topped with plain yogurt or whipped cream (depending on how sweet you want your toppings), fresh citrus (I also added a few pomegranate seeds for color but it honestly didn’t need them), a touch of fresh mint, and a sprinkle of powered sugar. The cake itself isn’t over sweet but may be a touch too much for breakfast (at least to my liking) so I like to enjoy this as a snack cake with tea. A strong mint or earthy roobis would be a perfect accompaniment. I went a little crazy with the different orange varieties when photographing this – tangerines, cara cara, and blood oranges. If you don’t feel like buying 3 different varities (I get it) then I’d recommend snagging the cara cara if you can. They have a slight red hue to them and they always seem to taste the perfect amount of sweet to me. This Winter Citrus Almond Cake With Yogurt & Mint recipe is an easy winter cake that can be enjoyed with coffee or tea. Make it when citrus is in season! Recipe adapted from an Alison Roman recipe. Preheat oven to 375 degrees and grease a 9 inch round cake pan with butter. Whisk together almond flour, all-purpose flour, salt, and orange zest in a medium mixing bowl. Set aside. Using a stand mixer fitted with the paddle attachment, beat together the beat together the butter and sugar on medium-high until light and fluffy. Add the eggs, one at a time, beating between each addition until completely incorporated. Increase speed and beat until mixture has doubled in size and is pale, about 5 minutes. Fold in the flour mixture just until incorporated. Transfer batter to prepared cake pan and bake for 30 minutes or until the top browns. Remove from oven and let cool. Dust with powdered sugar. To serve, dollop with yogurt, fresh citrus, and mint. These Pink Salt & Peppercorn White Chocolate Covered Strawberries are an easy dessert perfect for date night or to finish off a Valentine’s Day dinner menu. Did I tell you that I got engaged a few weeks ago? Yes! I’ve been a little quiet about it around here because it feels…very personal. I was never that little girl dreaming of her perfect wedding day – I was too busy dreaming of being independent in the form of having a cute little apartment on the top story of an old house with a big dog and vintage furniture. In fact, Wyatt and I have been together for almost 10 years (!!!) and we just started talking about marriage seriously in the last year or so because I thought I never wanted to get married. I always thought of marriage as something for old people and by not getting married then I just wouldn’t get old (which…we all know is just not true). And so when I talk about my engagement and a wedding, I almost just feel like a poser, an imposter. Marriage is not something I even knew I wanted but it feels so good now that I know it’s coming. I love Wyatt and I have no doubt that I want to spend the rest of my life with him so why not? Why not throw a big party to celebrate and make it official? Now onto Valentine’s Day – our tradition is to skip the restaurant madness and make a meal together (which is a rare thing in our home since Wyatt usually leaves the cooking to me). We usually make dumplings or homemade pasta or something a little more special occasion so a simple dessert like these Pink Salt & Peppercorn White Chocolate Covered Strawberries will keep the mood fancy without causes us to eat dinner at 10 PM because we over did it. For the white chocolate, I used Ghiradelli White Chocolate melting wafers (not sponsored, just what I found works best) which I easily found at Target. I’d imagine you could use melting wafers from Michael’s or the craft stores but I can’t speak to the quality of those. Let me know in the comments if you end up finding another wafer for these that you prefer better – I’m definitely interested! These festive strawberries get a pink hue from beet powder or freeze dried strawberries that have been blended into a powder. I offered the option for either because they are both delicious and not everyone can easily find beet powder at their local store (freeze dried berries should be easy to find in the snack section of your grocery store – I buy mine at both Kroger and Target). Just pop the berries into a blender (make sure the lid is on tight at the powder will blow everywhere) and blend until a fine powder forms. Easy? Easy as chocolate covered strawberries! Mix together the peppercorn and salt and set aside. Line a baking sheet with parchment paper. In a microwave-safe bowl, heat the white chocolate wafers on 50% power level in 20 second intervals, whisking between intervals, until the white chocolate is melted. You'll want to do it this way to avoid burning the chocolate as it will ruin the chocolate. Once melted, whisk in powder, starting with 1/2 Tbsp and adding in more until it reaches the desired pink hue. Working quickly, hold the stem of the dried strawberries and dip them into the chocolate until completely covered. Transfer to parchment paper and continue with the rest of the strawberries. Sprinkle a small pinch of the salt and pepper mixture over the strawberries and then let them harden for at least 15 minutes before enjoying. Looking for a munchies recipe to make for your next movie marathon or game night? 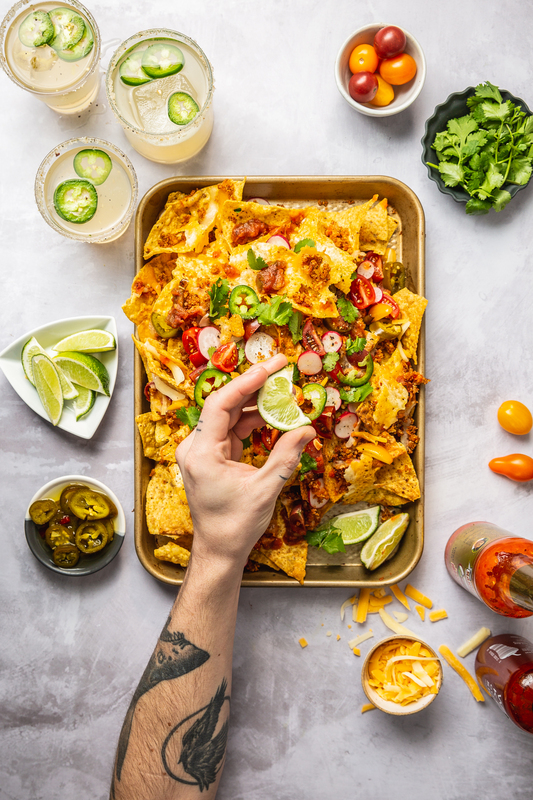 These Smoky Quinoa Vegetarian Nachos are easy to make, addicting, and super versatile so you can easily adapt the recipe to what you like most about nachos (cheese…lots of melty cheese). This simple 3 ingredient warming Ginger Lemon Honey Tea recipe is a go-to when feeling under the weather or like my body needs a little boost. I love that it doesn’t require a juicer and can be whipped up in a blender in just a few minutes. Anyone else feel like everyone around them is sick? Thank you, January, for not only being dark and cold but also spreading all the germs. To try to build up a little extra immunity power for my body, I’ve been drinking this lemon ginger tonic mixture every few days for the last few weeks. It’s been soothing on my sore throat while giving my body a little extra boost from the ginger and lemon. A lot of similar recipes to this online have you boil everything in a saucepan to let the ginger steep but my local coffee shop juices it all and the flavor of this method just packs such a bigger punch. I used to think you could only make this version in a juicer but I found a nice little cheat system though where you blend everything in a high speed blender and then just use a fine mesh strainer. The end result is deliciously sweet, spicy, and tart and the great way to mix-up your afternoon tea routine. Carrots Ginger Tonic: Add 1 peeled and trimmed carrot to blender along with the ginger and lemon. Spicy Black Pepper Lemon Ginger Tonic: Add 1 tsp whole peppercorn to tonic after you pour hot water in and let steep for 3-5 minutes. Thyme Lemon Ginger Tonic: Add 3 fresh thyme sprigs to tonic after you pour hot water in and let steep for 3-5 minutes. Note that I like my Ginger Lemon Honey Tea super spicy and tart so you may end up wanting to adjust your ratios a bit from what I have listed below. 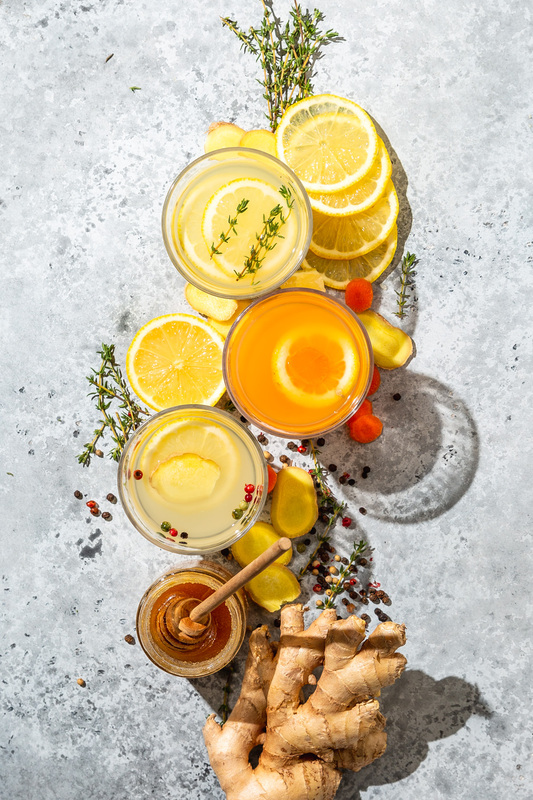 If the drink is too tart or spicy for you, just add more water and honey until you find the right equation for your taste buds. This Warming Ginger Lemon Honey Tea is my go-to when feeling under the weather or like my body needs a little boost. I love that it doesn't require a juicer and can be whipped up in a blender in just a few minutes! Place lemon wedge, ginger, and 1/4 cup water in a high speed blender and blend on high for 2-3 minutes. Meanwhile, boil the additional 1 cup of water in a water boiler or on the stove top. Use a fine mesh strainer to strain the lemon ginger mixture into a mug. Add honey and pour in boiling water. Let cool slightly and enjoy right away. Add more honey and/or water as needed. This Roasted Brussels Sprouts Salad With Maple-Balsamic Vinaigrette is inspired by Martina McBride’s new cookbook, Martina’s Kitchen Mix. It’s a hearty savory winter salad with a touch of sweet from the apples and cranberries. I’m one of those girls who wishes she was a salad person. I do this thing all the time where I’ll pick out a restaurant based on a salad I know they have that I really like and then we’ll get there and I’ll be like ‘dang but that (insert carb dish) looks so much better’ and guess what I end up ordering? Yup, you are correct – that carby cheesy dishes that wasn’t even on my mind when I picked out the restaurant. Ahhh well. Looking to incorporate more veggies into your diet? Check out these 15 delicious and easy vegetarian recipes which range from tacos to pizza to soup to more! 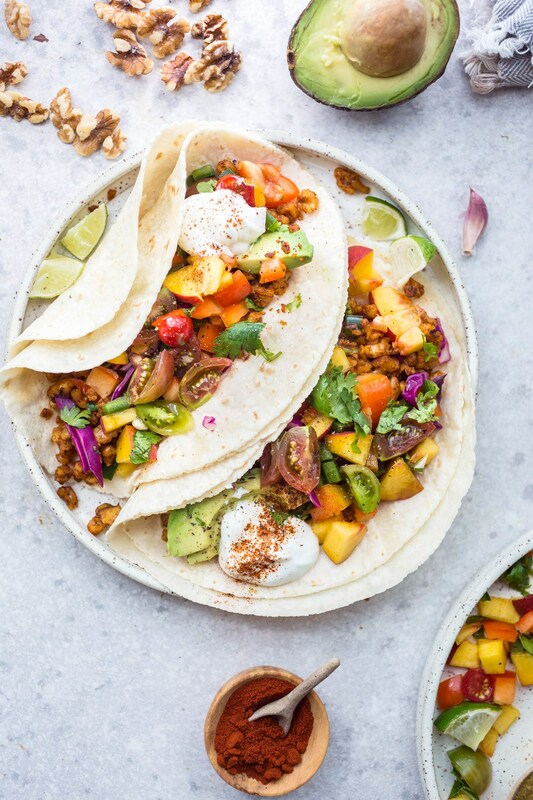 This Walnut Meat Tacos with Peach Tomato Salsa recipe can be made in under 20 minutes and requires minimal cook time! This Purple Corn Veggie Fritters recipe is so easy to make for weeknight dinner and can be altered to fit whatever ingredients you may already have on hand. Pizza time! Make sure to try this homemade Sweet and Savory Vegetarian Potato Grape and Rosemary Pizza Recipe! This Vegetarian Polenta Pizza Stuffed Peppers recipe is the perfect weeknight plant-based meal. Chocked full of nutritious vegetables, filling polenta, and gooey cheese, this main is sure to please everyone in your family! This Vegetarian Quinoa Taco Meat Tostadas recipe is a quick and simple meat-free weeknight main entree. The quinoa taco meat is a healthy substitute for crumbled beef and a must-try for any vegetarian! These Vegetarian Butternut Squash & White Bean Fritters with Blue Cheese & Walnuts are a quick and flavorful vegetarian meal that can be whipped up in less than 30 minutes. These Fried Eggs with Green Tahini and Pita are packed with spices and herbs and make a perfect simple dinner or weekend breakfast for two. This Vegan Pumpkin Baked Ziti recipe (from the Veganomicon cookbook) is a hearty vegetarian main dish. It can even be made ahead of time and baked just before serving! This Pumpkin Farro Risotto with Roasted Winter Vegetables is a great vegetarian holiday entree option or the perfect dinner for a chilly winter evening. This Creamy Quinoa and White Bean Risotto with Crispy Brassica Florets is from The First Mess cookbook. 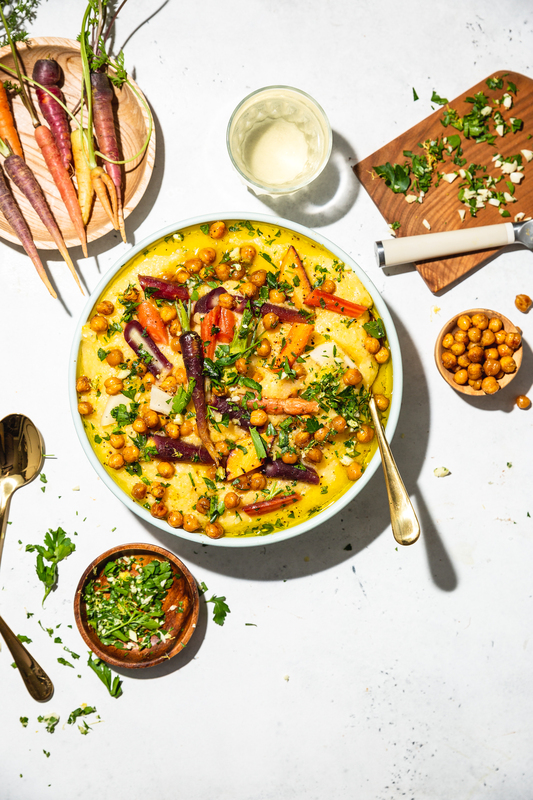 This healthy plant-based main dish is chocked full of protein (from the quinoa and white beans) and satisfyingly creamy. This Vegetarian Baked Ziti With Chorizo-Spiced Chickpeas recipe is packed with vegetables, protein-rich beans, gooey cheese, and deliciously carb-y pasta. This Smoky Vegetarian Red Beans and Rice recipe is loaded with up melt-in-your-mouth vegetables that are tender and packed with flavor. These Curried Veggie Patties with Coconut Quinoa are the perfect meal to throw together when you are trying to get rid of leftover vegetables or just looking to incorporate more veggies into your diet! Happy new year!! You all ready to conquer all your 2019 goals? I was so excited when Bob’s Red Mill andBlue Ribbon Orchard Choice Orchard Choice), creamy milk, and crunchy seeds or nuts to create a perfectly addictive meal. Cook the Bob’s Red Mill farro on Sunday afternoon and store it in an airtight container (it should keep in your fridge for 3-4 days). This will speed up your morning process because it just means everything will need to be warmed. 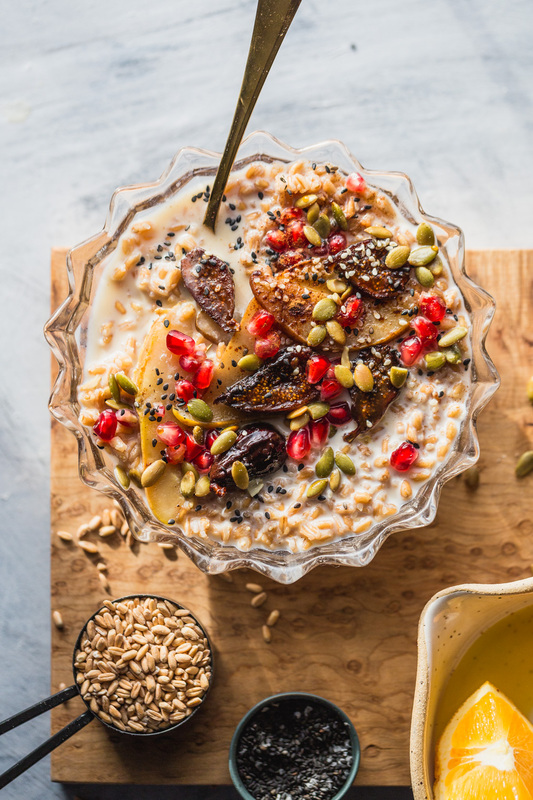 This Seedy Farro Breakfast Bowl Recipe With Warmed Figs & Pears can be meal prepped ahead of time for a quick and delicious weekday breakfast or snack! Rinse the farro and place in a saucepan with 3 cups water. Bring to a oil and reduce heat to medium-low. Let simmer for 30 minutes. Drain excess wate and set aside (you can also transfer to an airtight container and place in the fridge at this point if you are making farro ahead of time). In a small saucepan, heat butter over medium heat and add in figs, pear slices, cinnamon, and a dash of salt. Saute just until the pears are soft and fragrant and the figs are warmed through. Remove from heat and add stir in orange juice. 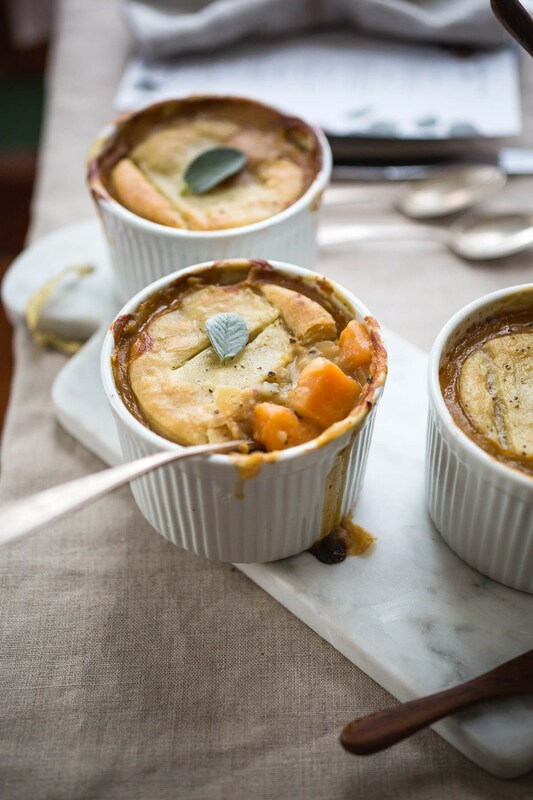 Use right away or store in an airtight container in the fridge (and just rewarm right before serving). When ready to serve, warm farro in a medium saucepan with milk (if only making one serving at a time, warm 1/4 of the farro with 1/4 cup of milk). Place farro in 4 bowls (if making a full batch). Serve with warmed figs and pears, seeds, and maple syrup. 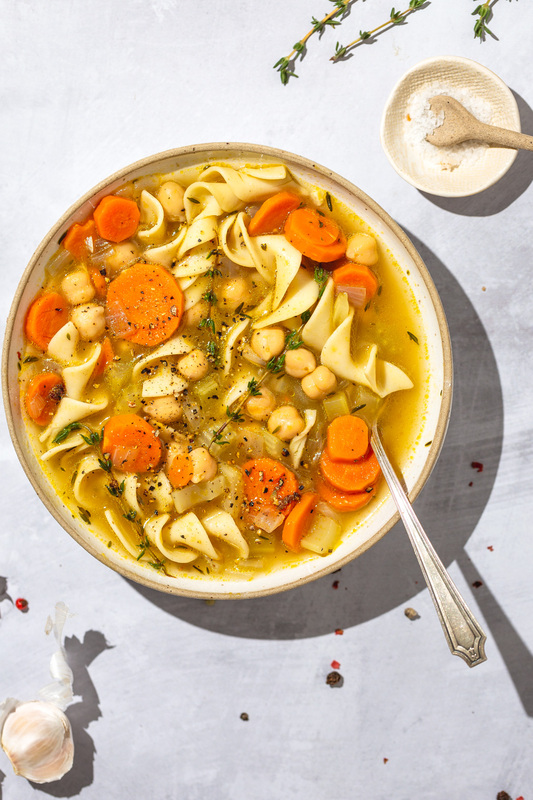 This Chickpea Noodle Soup recipe is chocked full of healthy vegetables, hearty beans, and chewy egg noodles. This soup is a great way to get more vegetables into your meal while still enjoying the comfort of delicious pasta. Happy New Year! Ready or not, it’s time for 2019! Can you believe this will be the last year in this decade?! I’m a bit in shock since I’m still listening to music like it’s the early 2000s (just joking…sort of). Anyhow, it’s sort of become a tradition for me to share a soup recipe (like this one and this one) as the first recipe of the year. I decided to share this Chickpea Noodle Soup recipe because it’s chocked full of vegetables (helloooo 2019 goal of eating more vegs) and beans but its not totally indulgent free because there are plenty of filling egg noodles in this as well. Need less microwave meals and more vegetables in your life? I’ve got you covered with a round up of easy and delicious vegetarian lunch ideas. Woooweee! We are really at the finish line now for 2018. Hope you all had a wonderful holiday season and are ready for 2019! Before I jump into sharing a few vegetarian lunch ideas, I wanted to quickly jot down some goals for the new year. I’ve always been that obnoxious overachiever that insists on writing down my goals every year and this year will be no different. Although I don’t always succeed with all of them (I see you goal of mastering video), it’s always so rewarding to go over my goals at the end of the year and see how much I did manage to accomplish. This batch of Holiday Stollen Homemade Cinnamon Rolls are perfect for Christmas morning or for a lazy weekend around the holiday season. A few Christmas seasons ago, I somehow talked my mother, aunt, and grandma into helping me make our family stollen recipe. The recipe called for several bags of flour, obscene amounts of fruit, required all of us to knead the huge pile of dough by hand, and took several days from start to finish. Needless to say, no one has suggested we make that recipe since. Even though our family recipe was beyond labor-intensive, I still loved the end result which was yeasty, boozy, and studded with just enough fruit to be sweet but not overly sweet. I made a stollen cookie in my first cookbook and although it’s a delicious shortbread, it doesn’t have the yeasty flavor I crave. After a few trial and errors, I was able to translate all my favorite parts of stollen into cinnamon roll form with these little rolls. 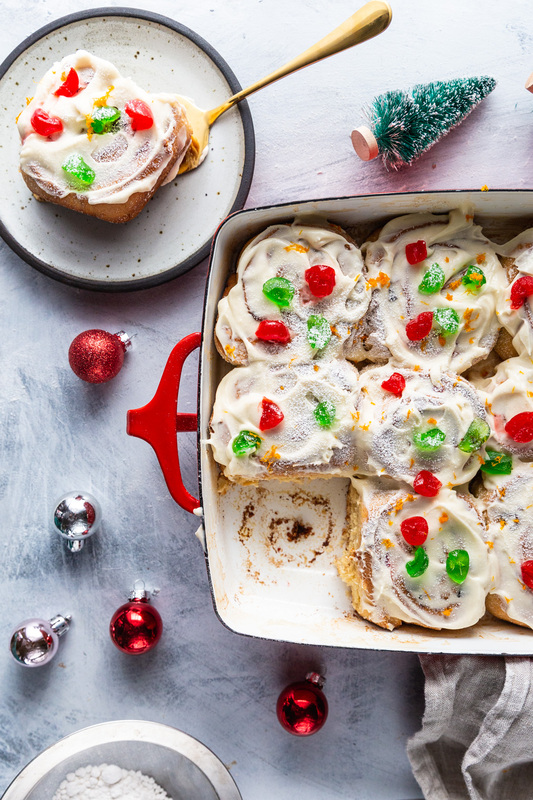 It’s a pretty amazing hybrid with yeasty base, rum-soaked fruit, cream cheese frosting, and a touch more cinnamon than traditional stollen has (but more of other spices that a cinnamon roll usually would). 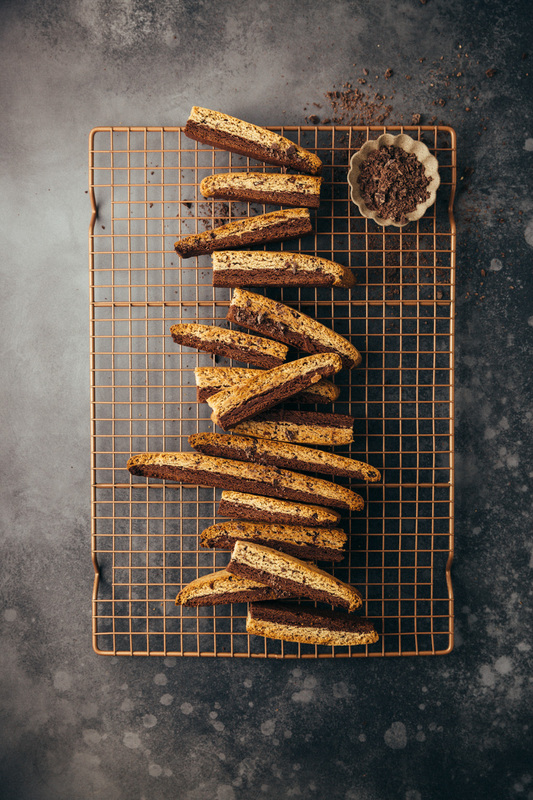 This Cardamom Coffee Chocolate Biscotti recipe is perfect for the holidays or when you are planning to have friends over for tea or coffee. The biscotti can be made ahead of time and stored in an airtight container for up to a week. Checking in for a quick one today and to share this amazing biscotti recipe! I made an addicting hybrid of the Spicy Double Chocolate Chip Biscotti recipe found in my Vegetarian Heartland cookbook and the Cardamom Coffee Cream Scones found in my Platters and Boards cookbook! These end results are a subtly sweet biscuit meant to be dunked in teas and coffee. I promise that the instructions look more complicated than they are – you are basically going to make one dough that splits off into two bowls (so you can add two different flavors) and then pile one part of the dough over the over so you end up with an impression looking two flavor biscotti. 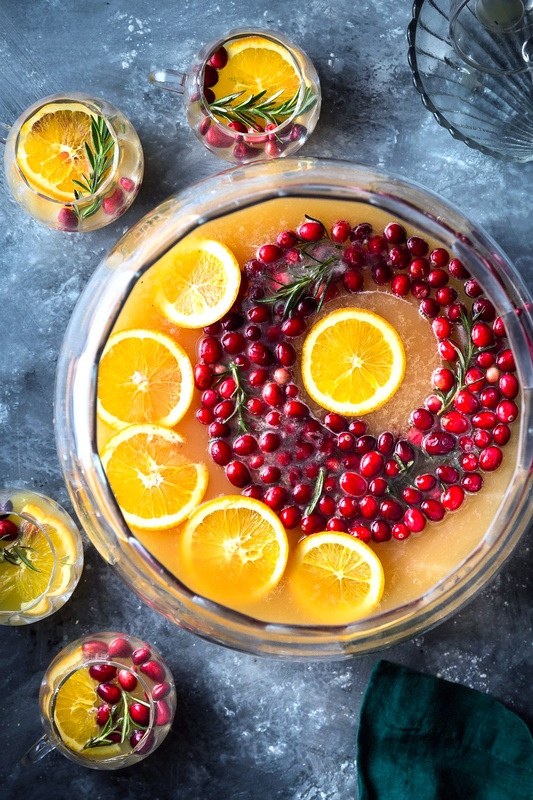 This Cranberry Orange Punch With Cranberry-Rosemary Ice Ring is only 6 ingredients and a totally show stopper for your holiday parties! This Apple Cider Gravy recipe from Julie Turshen’s Now and Again cookbook is both savory and tangy. It’s a perfect gravy for a special occasion like Thanksgiving or a lazy morning with biscuits and eggs. Thanksgiving is officially a week from today – are you ready? This is the first year we will be hosting at our new home and I’m beyond excited / nervous / overwhelmed. There will be about 15 of us and I have no idea how they will all fit into our 900 square foot home (ha). To calm my nerves a bit, I’ve started testing some of the recipes from the menu ahead time and this Apple Cider Gravy from Julie Turshen’s Now and Again. I was drawn to this Apple Cider Gravy recipe because I always think of gravy as super savory so I was very curious to see how a healthy helping of acid would alter the flavor. The results were still deliciously savory with a tint of tang that was surprisingly wonderful on top of a pile of biscuits and eggs. I dare say this could even replace our go-to recipe we’ve been making for years! This Apple Cider Gravy is from Julie Tushen’s newest cookbook, Now and Again. I was beyond excited to receive a copy of this from Chronicle Books since I was such a big fan of her first cookbook, Small Victories. This has a similar approach in that all the food in the book is very accessible while still being creative and feeling new. Now & Again is sorted by seasons and then again by menu themes. What makes it extra unique is that Julie then gives recipe ideas on how to use the leftovers so nothing goes to waste. It also has an ideal mix of everyday recipes and special occasion recipes. I highly recommend you checking it out if you are a cookbook fan and looking for new inspiration! This Apple Cider Gravy recipe from Julie Turshen's Now and Again cookbook is both savory and tangy. It's a perfect gravy for a special occasion like Thanksgiving or a lazy morning with biscuits and eggs. Add onion, garlic, sage, salt, and pepper and cook, stirring often, until everything is softened, about 8 minutes. Add flour and, stirring often, cook until it turns the color of a milky cup of coffee, about 5 minutes. Next, while whisking constantly, slowly pour in the stock and the cider. Bring the mixture to a bowl and then lower heat and simmer, stirring often, until thickened, about 10 minutes.